Throughout their history, the Soviets have not been a people to care much about the environment. It could be said that this is because they have so much land it doesn’t really matter. Either way, the damming of the Angara River, which began in 1955 perfectly shows the lack of preservation that many Soviets had. 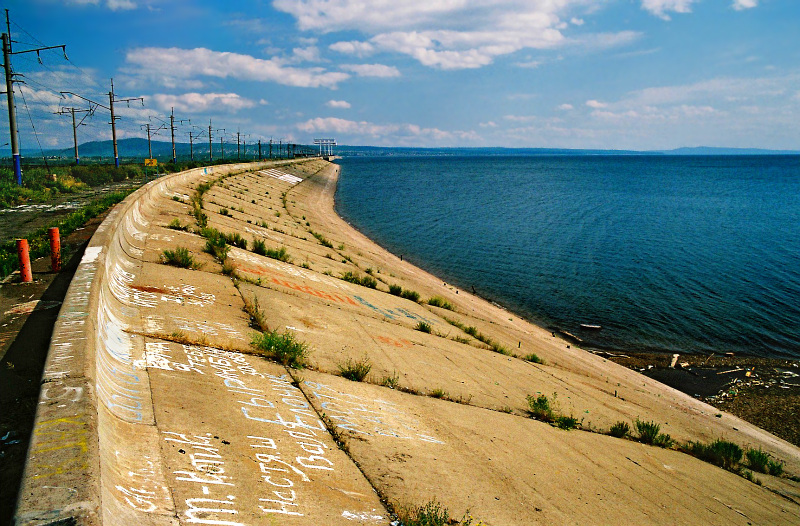 The Bratsk High Dam is one of four dams on the Angara River. It began construction in 1955 and was operating at full power with 18 turbines and the capacity to generate 4.5 million kilowatts of power by 1969(1). 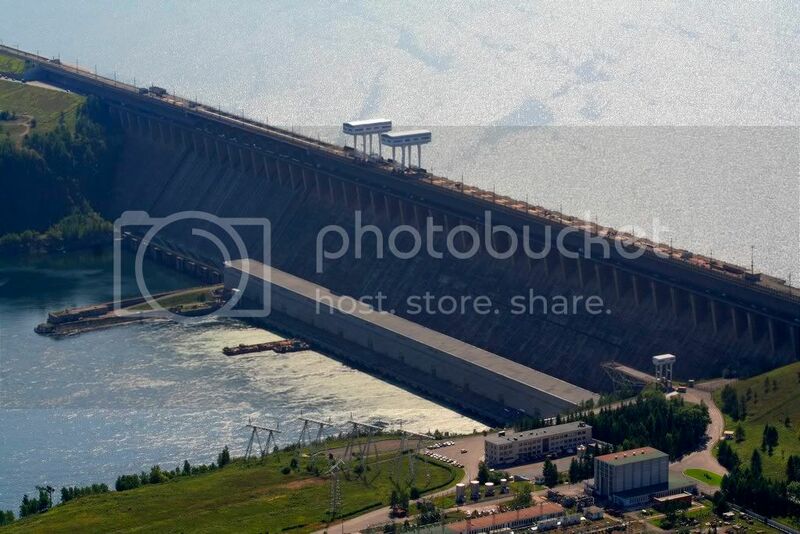 At the time of its construction, the Bratsk dam was the largest and most powerful in the world. A majority of its energy goes to nearby industry and manufacturing, “including a wood-processing combine capable of turning five million cubic yards of wood into various products, and an enormous aluminum plant”(1). These factories, as well as the actual damning of the river help to contribute to diminishing fish populations and mass amounts of pollution in the Angara river as well as Lake Baikal(25% f the world’s freshwater). Fish are also affected by the damn since it disrupted the natural flow of the river and created a huge basin. “After the river was dammed with the 3 miles of concrete, the water level rose 479 feet”(1). This is also known as the Bratsk Sea since it is one of the largest artificial bodies of water in the world(1). Even though the dam helps to destroy water quality and fish populations, the construction of the damn was an impressive feat. The workers had to build through the freezing temperatures of the Siberian winter, which gets down to -72 degrees Fahrenheit with frost on the ground for about 3/4’s of the year. It was also a great challenge to transport materials and workers to Bratsk due to its remote location. The building of the Bratsk damn shows how far technology came for the Soviet Union and is a testament to their power at the time, but it also brought along negative side effects. The destructive progressiveness of the Soviet Union can be represented by Valentin Rasputin and his work Farewell to Matyora, which describes the downfalls of technology and the loss of Russian peasant culture during the Soviet Union through depicting a 17th century village that becomes flooded by the dam. It does amaze me reading about all these feats that the Soviet Union managed to accomplish during the 60s. The Soviets managed to put the first man on the moon, engaged in a campaign to spread communism around the world, and now can boast that they had once built the largest dam in the world while overcoming the bone-chilling Siberian climate. Of course, this over-exertion probably what led to their demise. As the Seventeen Moments article points out, this dam was seen as a “conquest of nature.” It is pretty impressive besides its lack of consideration for the environment. This is just another instance of the Soviets working hard to move forward in science and technology. See posts on the space race for more examples of this! Farewell to Matyora is a great story, and exemplifies the best of “Village Prose” from this period. Thanks for writing about this topic! You are really passionate about this in your post which makes it all the more interesting. I didn’t know that the creation of the dam caused so many environmental problems. This post was very thorough and informative. Great information about the Bratsk High Dam. Projects similar to this often were seen as a way to generate jobs and stimulate the economy, and these benefits were thought to be worth the cost of great harm to the environment. Other Dam projects that used this model were the American Hoover Dam in the 1930s, the Egyptian Aswan High Dam in the 1970s, and the Chinese Three Gorges Dam in the 1990s. Similar to this could be the sheer amount of construction in modern China and the lack of environmental concern. The amount of economic and infrastructure expansion in the USSR after WWII led to all these advances but at a cost. Now, growing superpowers like China are causing major environmental issues at the price of their nations advancement. Great post! I loved the picture and all the information about how the dam caused environmental troubles. This seems like one more instance where the Soviet Union wanted to prove their superiority over the US and other westernized countries, even though they completely disregarded the environment in the process. The most shocking thing in your post was the fact that workers built the dam while experiencing -72 degree weather. I can’t comprehend that. Props to the workers for building this, but perhaps the Soviet Union should’ve given much more consideration to environmental factors first. I think it is interesting how many feats and accomplishments the Soviet Union accomplished yet these are not usually portrayed in the common telling of the Cold War story. The Soviet union was able to accomplish so much in the space race, science, and engineering, yet these are under represented compared to US accomplishments. The Bratsk High Dam is a great example of a major accomplishment which is not nearly as famous or recognized as many US accomplishments such as the Hoover Dam. Cool post. I like to read about the technological feats and accomplishments of the USSR. The 1955 construction of a dam that size show’s the determination and ability of the Soviets fairly well. Although it is an ecological setback, it does show the capability of the communist party in exercising their authority. I can’t believe the conditions workers were under when building the dam, those freezing temperatures must have had such an effect on them, I wonder how many died from freezing. The fact that this dam was the largest and most powerful in the world during this time must have been an impressive fact that Russia would want to share with the world, showing their technological advancements and in trying to keep up with the west. The Soviets Loved to Drink…Champagne?